I love a good old fashioned graff war, especially when the stakes is high. 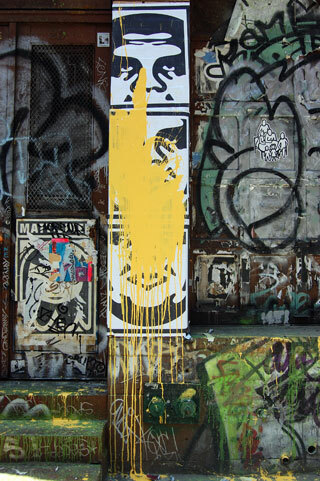 After months of silence, it looks like Shepard Fairey's recent work on the streets of NY has brought The Splasher out of hiding. We're assuming this is all related to last week's stink bomb incident in DUMBO. It's clear that The Splasher just targeted the Shepard Fairey piece and left the surrounding streetart untouched. This is looking more and more like a battle-to-the-def beef betwixt the Splasher and Shepard Fairey for control of the soul of the New York City streetart scene. Oh, dip! The streets most def be watchin and if The Shep wants to show that he's still on the block and he's still street, he'd better step up and answer with the quickness high profile and loudly. Step up Shep!